The perfect place to stash your phone, wallet and more. Keep vital gear, food, optics and electronics dry and dust-free with this 3-pack of All Purpose Dry Sacks. Great for camping, canoeing, kayaking, hiking and more. You get 3 differently-sized Bags. Small and Medium Bags are flat, envelope style. Large bag has a circular bottom for greater capacity. 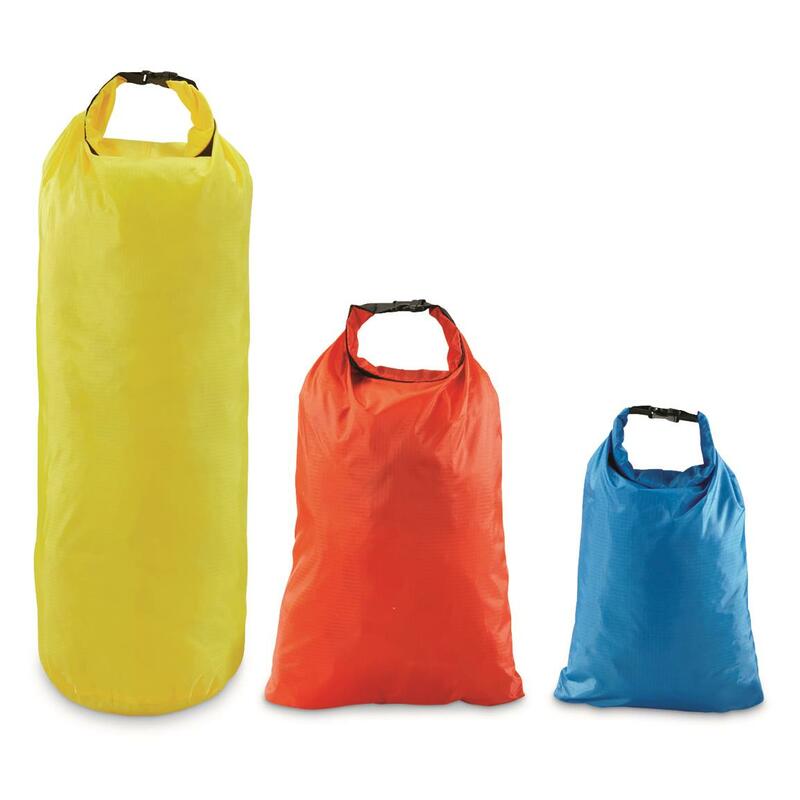 All Purpose Dry Sacks, 3 Pack is rated 4.5 out of 5 by 64. Rated 5 out of 5 by TBKillen from Works great! Keeps things dry. Three sizes for different sized items. Works great for my kayak. Rated 5 out of 5 by TS85 from Great Product. Great Value! These work great. Rated 2 out of 5 by charles from They are definitely NOT waterproof. They are water resistant. Rated 5 out of 5 by Passinthru from Perfect for their intended use. These bags are just as described - small, lightweight, water resistant. If you read the description and the reviews carefully you will not be disappointed in either the size or the construction. These bags are exactly what I wanted for keeping a few items dry in canoe, kayak, or pack.I tested each of these bags in a bucket of water. Each one was watertight if the top was rolled 4 times - rolling only 3 times allowed a few air bubbles to escape at the top. The largest bag has a circular bottom (as the description indicates) - the 2 smaller bags are a flat, envelope type construction.Yes, as others have said, I was able to get my 20 degree, down sleeping bag into the large bag. 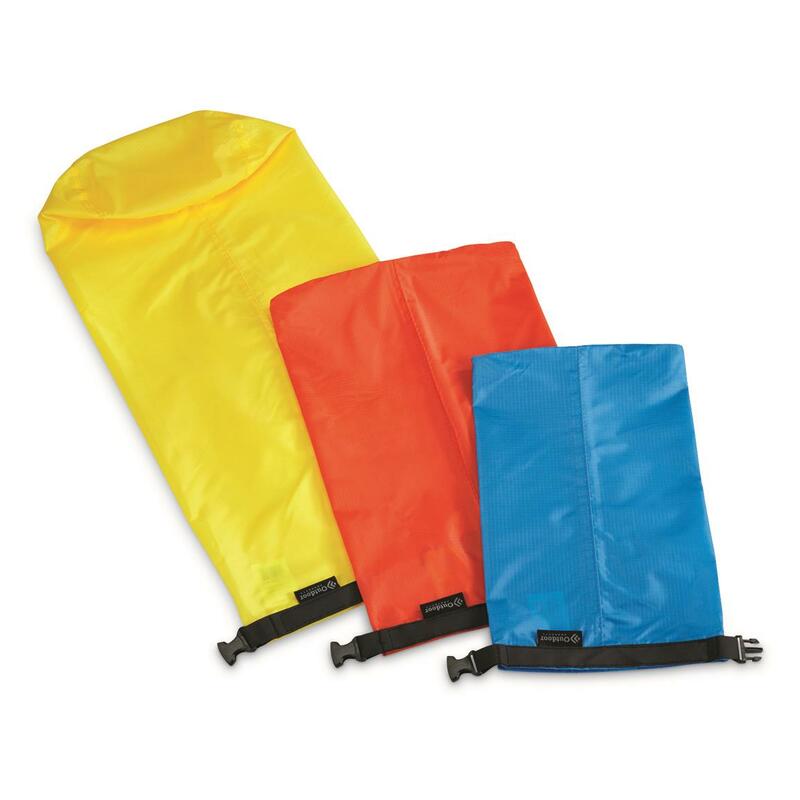 A synthetic bag may not compress enough to fit.If you treat these roughly they will probably not hold up as well as the heavy PVC bags but these seem perfect for their intended use.